It's in the teeth. An odd mosaic of dental features recently unearthed in northern Egypt reveals a previously undocumented, highly-specialized primate called Nosmips aenigmaticus that lived in Africa nearly 37 million years ago. Because it is only known from its teeth, the paleontologists who discovered it don't know what its body looked like, but the find likely represents an ancient African lineage whose discovery makes early primate evolution on that continent more complicated. "It comes as a bit of a shock to find a primate that defies classification," said lead researcher and assistant professor of Anatomical Sciences Erik Seiffert of New York's Stony Brook University. Seiffert says during the last 30 years or so, three major primate groups were established as being present in Africa some 55 to 34 million years ago: early monkeys, lemur-like primates, and an extinct group called adapiforms. But the newly discovered primate's teeth place Nosmips in Africa at the same time. What's more, its teeth suggest it could be an evolutionary oddity that is not closely related to any of these groups. Nosmips' discoverers report the finding in this week's Proceedings of the National Academy of Sciences. The National Science Foundation supported the research. "When you find the teeth of a fossil primate, it's usually pretty clear where it fits into the family tree," said Seiffert. "There are only a few species that nobody agrees about and that really can't be placed into any of the major primate groups. These mystery fossils must have something important to tell us about primate evolution." 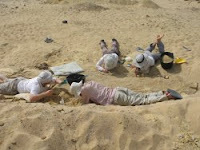 Right now Nosmips is one of those rare mystery fossils and so far is only known by 12 teeth, most of which were found in isolation at a site in the Fayum Depression about 40 miles outside Cairo, Egypt. The discoveries result from work during several field seasons over nine years. Paleontologists usually identify primate fossils by their teeth because teeth are the most durable parts of the body and are most likely to fossilize, and so are most likely to be recovered. "We were lucky to find even two teeth of Nosmips in each field season over the course of the nine years," said Seiffert. "That amounts to over nine months of continuous work. Only through working over such a long time span were we able to piece together the arrangement of Nosmips' teeth." Analysis shows Nosmips had a rare combination of enlarged and elongated premolars with simple upper molars. It also had premolar teeth that had taken on the form of molars, instead of being relatively simple as in most other primates. "Nosmips appears to be a highly specialized member of a previously undocumented and presumably quite ancient endemic African primate lineage" Seiffert said. The researchers note that Nosmips lived alongside another specialized primate named Afradapis, which the same team described last year in a paper in the journal Nature. Seiffert and colleagues compared the teeth of these extinct species with those of living primates, and determined that Afradapis had adaptations for eating leaves, whereas Nosmips probably ate more fruits and insects. "As time goes on and more discoveries are made, it will be fascinating to see how different lineages contributed to primate diversity in the Eocene of Africa," Seiffert said.